The Trek Collective: Finally a cover for The Assassination Game. Plus Harbinger reprint? Finally a cover for The Assassination Game. Plus Harbinger reprint? 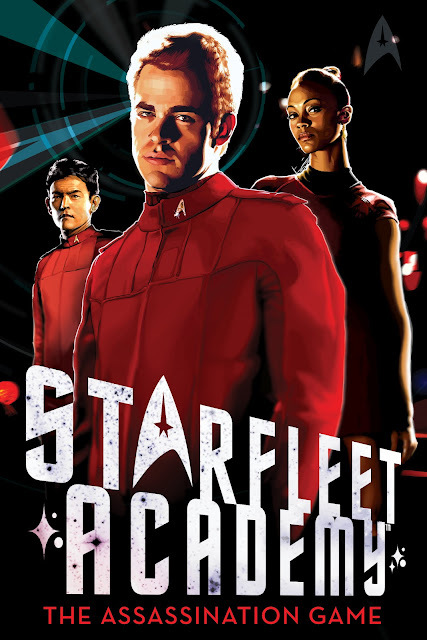 The latest book in the new timeline Starfleet Academy series, The Assassination Game, is supposed to be out in a week, but it's only now that the Simon and Schuster listing has finally been updated with a cover for the book! Here it is, with everyone in red; perfect assassination colour! Pre-order: Amazon.com, Amazon.co.uk, Amazon.ca, Amazon.de, Amazon.fr, Amazon.es, Amazon,it, Amazon.co.jp, Forbidden Planet. You can also read an excerpt, chapter one from the book, here. The Simon and Schuster online catalogue also has a new entry; under the Gallery Books imprint there is now a listing for the first Vanguard book, Harbinger. Gallery Books normally do the larger format Trek books (plus the new ebook releases, but this is listed as paperback), so one assumes this will be a trade paperback reprint. It's listed with an August release.